It’s freezer cooking time again. Last month, we focused on breakfasts, and I had a blast in the kitchen with the kids. The blueberry pancakes were gobbled up quickly, so I’d like to make some more of those this month. Other than that, I’m not going to do anything time-intensive. I’m going to stick with a few basics which allow me to make home cooked meals in minutes down the road. Recently, I browned and froze about 12 lbs of ground beef, and stir-fried about 3 lbs of chicken. 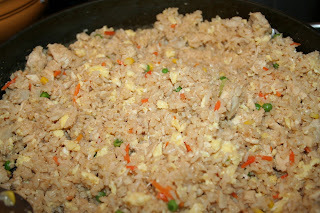 These can be used in multiple recipes like the chicken fried rice below. For this month, I’m going to cook 2 lbs of beans in the crockpot with taco seasoning. I’ll freeze them in quart sized bags to be used as side dishes or in recipes. I’m also going to cook several rice-cookers full of rice. Rice cooked this way is ultra-easy and only takes 30 minutes. Sometimes I have 30 minutes. Sometimes I don’t. As much as I’m trying to be consistent with meal planning, and as much as I realize that it makes a huge difference in my deslobification process, there are weeks when I just don’t do it. This was one of those weeks. With Labor Day throwing me off and then my 7yo’s birthday party to plan, I never planned our menu for the week. And yet . . . we ate home cooked meals every night except when grandparents took us out for a birthday dinner. 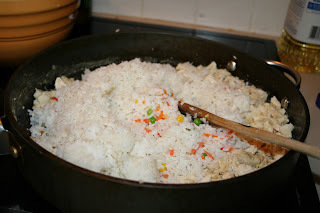 One night, I threw together a casserole using the pre-cooked chicken which took about 5 minutes prep and 30 minutes in the oven, but the other night I made chicken fried rice in about 15 minutes . . . from start to finish. Here’s the “recipe” I use. I learned how to make this from a student in my speech class when I was teaching in Thailand. First of all, you need to understand that chicken fried rice is supposed to be made from leftover rice. The rice should be dry. If you do have to cook the rice just before making it, use less water. My student drew a picture of a finger stuck in the pot of rice and water, with the water going up to the first finger joint. (Now do you understand why I put quotes around the word recipe?) Basically, instead of using 2 cups of water for every one cup of rice, you could use 1.5 cups of water. Or, even better, cook the rice ahead of time and freeze it in a Ziploc bag. While you are partially defrosting the pre-cooked chicken (you can use any cooked chicken chopped into small pieces), put some oil in a very large skillet or wok and scramble some eggs. I generally use 3 or 4 because my kids act like they won the lottery when they get some egg. You could use one or two. Once the egg is soft-scrambled, take it out completely and put it in a dish to the side. Add a little more oil to your pan. By this time, your chicken should be at least mostly thawed, and you can throw it in the skillet. If you didn’t cook it with garlic and onions the first time, now would be a good time to add them in. While the chicken cooks, put your veggies in the microwave to either thaw them partially, or steam them. 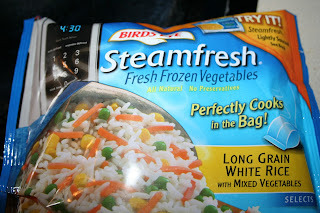 When I can get Steamfresh veggies for free, I like to grab the rice with veggies. I add it to this dish, and it has the perfect ratio of veggies, and adds some more rice if I’m worried that I don’t have enough. If I don’t have any of these, I just partially thaw whatever mixed veggies I have. Peas and carrots do well. Once your chicken is heated through, and/or your garlic and onions are how you like them, add in your veggies and let them finish cooking. While you’re doing that, be sure your rice is thawed enough that you can break it into smaller (though possibly still partially frozen) chunks easily. 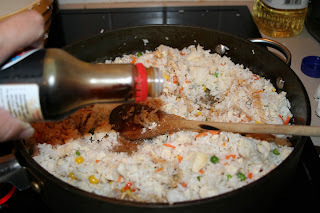 Keep breaking up the rice and stirring until the ingredients are evenly blended. At this point, drizzle soy sauce across the top and stir to distribute. As you stir, the rice will start to look like fried rice. Add soy sauce, a little at a time, until the rice looks and tastes like you want it to. 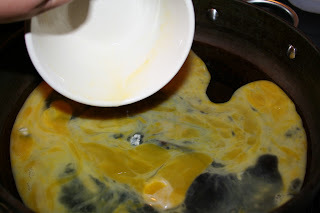 Your final step is to add the egg back in and continue stirring until it’s well mixed. Using only frozen ingredients, most of which I pre-cooked and froze myself, I can have dinner on the table in no time. AND, this just happens to be one of those meals that brings literal cheers from my family. They love it! I’m sharing this freezer cooking plan over at Money Saving Mom. She and Life as Mom are hosting Freezer Cooking Days. Go check some other freezer cooking plans! I’m linking up this (older) post to Life as Mom’s Recipe Swap where people are sharing easy busy night meal ideas. I can make this Chicken Fried Rice, in such an incredibly short amount of time – AND it’s an absolute favorite for everyone in the family! Here is where I buy 40 lbs of chicken at one time for a great price (yes, that was an affiliate link!) and see how I manage 40 lbs of chicken here. I am so sorry to say that it seems Zaycon has gone out of business. I say “seems” because the information I’ve seen says they’ve “suspended” operations and I don’t fully understand what is happening. I’m so so sad about this since this will change how our family keeps our freezer stocked with meat. We’ve been ordering almost all of our chicken, bacon, and shrimp for them for more than five years. If you had ordered recently, I recommend that you call your credit card company or bank (for debit cards) to see what can be done. I’ve heard many people have had success doing this. Read Older Post Ugh. Exercise. That looks fabulous and easy enough. I am book marking this and making it this week. Thanks so much for sharing. That looks fantastic and easy. Every time I've tried to do fried rice it's been a major flop and now I know it's because I used freshly cooked rice. Thanks! Thanks for the fried rice recipe. I've tried to make it a few times and it turns out mushy despite using day old rice. I will try your recipe and see how it goes. This looks so yummy I've got some Chicken thawing in the fridge right now… I was thinking Chicken Nachos but I think I've changed my mind… I could totally do this… Thanks for sharing! If you are looking for something different to add to your stirfry, try sliced almonds. (You want the ones that are sliced across the almond to make flat slices, not the ones that are in little sticks.) Just take a small fry pan and put them in there with no oil or anything on medium heat. When they smell good and are just starting to brown, take them off the heat. Then you can either chop them up a little more or just add them as is. The way your kids feel when they get a piece of egg in theirs, is how I feel when I get a nice slice of almond. I also like to serve mine with an assortment of Asian sauces that people can stir into their own to add a little extra flavor (sweet and sour, lemon, plum, etc). Looks yummy. I just want to add that you definitely need to use Thai Jasmine rice and don’t forget the naam pla (fish sauce), lime wedges, and cucumbers!! 😉 And even fresh sliced Thai chili peppers..mmmmm! ….from the Thai Girl. Made this tonight and my kids actually ate it! I had 2 bags of the frozen veggie/rice mix (bought after i saw them in this recipe)so I just used both and no extra rice (I didn’t have any made) and pre cooked chicken I had made from your site. Came together super fast and tastes yummy. Thanks! Yay! I’m so glad you liked it! It makes me laugh that this is what hubby requested for his birthday – couldn’t be any easier for me! I finally tried your fried rice recipe about two weeks ago, and have made it probably four times since…! Everyone LOVES it. It is so easy and I feel accomplished making something that I would normally get on one of those “Oh dear Lord, the kids are getting home from school and I’d better get something from the deli” nights. It’s almost as fast & easy, and way healthier. Thanks! Wow, I never would have thought to use coleslaw as the veggies! I’ll definitely try that! And freezing it? Perfect! Just pulled out batch-cooked chocolate chip pancakes for breakfast this morning. Found chocolate flavored chips at HEB for .25 a bag and they inspired me to batch cook pancakes and muffins. So nice to have on hand, especially when school starts and my girls will be eating there and I hate making a mess just to feed my 3 year old. Love this. It is easy and perfect for busy families! Shoot. I keep forgetting to get a rice cooker. I did buy one, but when I pulled it out of the box, found that it was non-stick, and I won’t use any Teflon coated pans…so I took it back. Now I just need to find a stainless steel one. 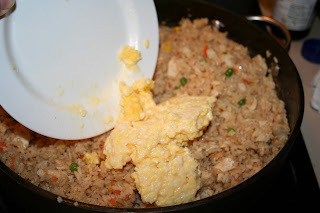 Do you think you could freeze the chicken fried rice for a quick meal. I’m always looking for something different to have on hand for when my son wants a meal packed with gluten, something I can just pull out of the freezer, heat and eat…and this looks really good. I don’t know, we always eat it ALL so fast! But I really do think it would be worth a try since all the ingredients (except maybe the egg?) freeze well. The egg should freeze fine since it’s scrambled (and cooked.) I keep chickens, and when eggs are in abundance, I scramble them and freeze raw, and they cook up just fine when I pull them out later and thaw. JUST made this tonight and yum! My husband said “we” should add it to “our” repertoire. Haha! Translation…he wants me to cook it regularly. Thanks for the recipe! Yay! So glad you loved it! I still get cheers of joy from my family every time I make it! My kids grew up on fried rice. Our favorite meat to add is leftover ham. I do not add soy sauce – it’s passed on the side.